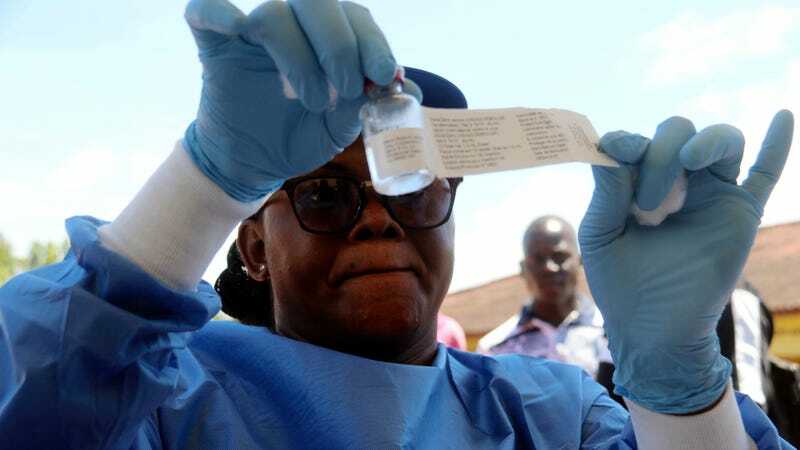 A health worker prepares an Ebola vaccine to administer to health workers during a vaccination campaign in Mbandaka, Congo. The latest Ebola outbreak has claimed yet another life in the Democratic Republic of Congo, raising the death toll to 12—though the actual number may be as high as 27. Using a strategy known as “ring vaccinations,” officials began treating doctors and other frontline healthcare workers in Bikoro, the town where the outbreak was first declared in early May. The DRC government declared the Ebola outbreak on May 8 after two cases were confirmed by lab tests. The outbreak is currently confined to the Bikoro region of Equateur Province in the northwestern part of the country, but the detection of Ebola in the city of Mbandaka on May 17th represented a worrisome development. As of today, the DRC says there are about 56 cases of hemorrhagic fever (a primary symptom of the disease) and 35 confirmed Ebola cases, of which 13 are probable and eight suspected. This is the third Ebola outbreak in the DRC in the past five years and the ninth since 1976 when the disease was first identified. The Democratic Republic of Congo is located in the heart of sub-Saharan Africa and is home to nearly 79 million people. Earlier today, DRC Health Minister Oly Ilunga traveled to Bikoro, a small market town located 78 miles (126 km) south of Mbandaka, to oversee the vaccinations of at least 10 people. It was here that the outbreak was first declared three weeks ago and at least five Ebola deaths have occurred so far, according to the Associated Press. Officials are employing a strategy known as ring vaccinations in which the people who are most likely to be infected are treated. Today’s vaccinations included three doctors at Bikoro Hospital, two health experts, two nurses, a woman’s community representative, and a pygmy representative. The drug used was the experimental rVSV-ZEBOV, and all vaccinations were voluntary. Ring vaccinations started on May 21 in Mbandaka, with 7,560 doses ready for immediate use, according to the World Health Organization. The drugs were donated by its developer, Merck, while Gavi, the Vaccine Alliance has contributed $1 million towards operational costs. Ground teams are currently searching for and following up with all known contacts, of which 600 have been identified to date. On May 18, WHO said the current outbreak is not yet an international emergency, but admitted a “vigorous” response was still necessary, both on the ground and in terms of funding its $56.8 million Ebola strategic response plan. WHO is currently working to prevent the disease from crossing the DRC’s nine borders, CBS reports. Also, several schools have been shut down in the Iboko health zone as a precaution. The next few days and weeks are critical in ensuring the outbreak doesn’t escalate any further. The current outbreak involves the Zaire Ebola virus, which is known to be fatal in up to 60 to 90 percent of cases. Ebola spreads from person to person via contact with bodily fluids, but it often makes the jump to humans from wild animals such as bats and monkeys.